This week I completed an art doll that recalls my very first figure sculpture that crossed that figure sculpture to art doll line. That piece titled “No Rag-Doll” was a mixed media mash up of a non-floppy rag doll, and a metal sculpture. It was that piece that hooked me, and made me want to explore figure sculptures expressed as art doll more. My new not-so-floppy rag doll is titled “Rag-doll Retool”. She is a reimagined steampunk version of a rag doll. For this piece I started with a sculpted polymer clay face, with layered paint and glaze eyes. Metal facial elements were sculpted over the baked clay then drilled and glued in place with miniature metal hardware elements. Her body is my usual padded fabric over wire fame, with the addition of a fabric soft-sculpted head and hands. All elements of this art doll’s clothing are hand sewn in place, as is her natural fiber wigging. 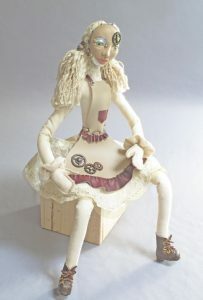 My Rag-doll Retooled will make her gallery debut in September during my gallery show. I needed to work on some more jewelry pieces for the gallery this week as well. 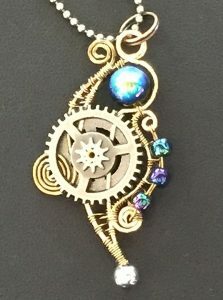 The Steam Doodle pendant above is just that, a doodle that started with a piece of wire rather than a line on a paper. The initial twisted shape I then added to, until it felt complete. I’m finding with these wire wrapped pieces that this more improvisational approach seems to work. Start simple, add a piece here and there, and sort of let the jewelry design itself. This pendant is paired with a ball chain, and is available at the Hillsborough Gallery of Arts. This entry was posted in Uncategorized and tagged art doll, figure sculpture, mixed media, one of a kind, OOAK, rag doll, sculpture, steampunk, the Hillsborough Gallery of Arts on July 15, 2016 by lynnadmin.